Daddy had an uncle he liked a whole lot, a man he called Moon. Moon was this sort of rounder who made money in the war as a pimp down in Galveston. He’d pick up the sailors down there and show them around town, show them a good time, and eventually he’d introduce them to the ladies he knew. Of course that was the point anyway, but he made it all look accidental. He liked to trade racehorses, too, and sometimes he raised cattle, which I think he did after he got a little older. But then he gambled his whole life away—till the day he died, they say. Daddy told this story about the time Moon got a new saddle, a brand new Mexican saddle that he had picked-up down on the border. Daddy said it had silver scrollwork all over it. Moon got this saddle and showed it to Daddy because he was real proud of it and he liked Daddy real well. He was just a boy, but still Moon liked him. The thing was Moon told him not to play with it. He told him it wasn’t a toy. That didn’t matter though. Daddy I’m sure got that saddle out as soon as Moon turned his back. He took it and tossed it up on one of Moon’s horses. But before he could get up, that horse spooked. I guess that horse ran from one end of the world to the next with that Mexican saddle hung down beneath its belly. Drug it all over creation. Brand new saddle. When the horse finally stopped Daddy had to go around and pick-up what was left. Then he had to go tell Moon what happened. You can imagine, thing like that. Daddy just a boy. He said he was standing beside a fence in front of Moon’s barn there. Pieces of saddle in his hands. Then Moon saw him and saw what was left of his pretty Mexican saddle. He came over to Daddy, looking all the time at them saddle pieces and back at Daddy. He asked him, what happened to my saddle, Pee-pot? He called him Pee-pot because Daddy once wetted the bed. I busted it, Daddy told him. I didn’t mean to though. Daddy said that old man’s hand came up quick and took him hard around the throat. I guess he held Daddy pinned to the fence, stared at him real hard then told him, Pee-pot you ever do something like that again, I’ll kill you. Then he let him go. And that’s all. That’s all he said. Now a man will keep a story like that. It’s not everything though. All this down here. The gulf just off the way there. The sky like it is. It’s maybe why I keep the grounds. I know it’s part of why I came back to this country. 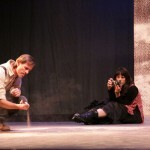 From the play, The sun is in the West.